We had plans to go to Mermet, but once we heard about the terrible viz we decided to drive the extra 80 miles to Penny Royal. One of the best decisions we made in a long time. This was the first time we dove the quarry located in Hopkinsville, Kentucky. One in our group was finishing up a dry suit class on Sunday at Mermet, so we went back to Mermet on Sunday, but the diving on Saturday was absolutely fabulous at Penny Royal. Viz was atleast 30 feet maybe more. We didn’t attempt any deep dives because we were all new to the drysuit thing. The attractions are located in shallower water 30-40 feet. I was amazed at the visibility of the quarry. Very good. The water was a little on the colder side, mid 50’s. Dennis, owner, and his son, Kyle are great people. They explained the quarry to us and came and talked to us during the surface intervals. They suggested a great steakhouse in town (can’t remember the name). Great steak – 2 inches thick and cooked to perfection. If you visit the quarry definately check this place out – Dennis can tell the name. Accomodations: They have a snack shack that serves burgers and such, a changing room, that needs a little repair, and no running water (johnny on the spots). Really my only gripe is that they don’t clean the attractions – a lot of silt built up on the motorcycle and boats and such. All in all a great day of diving and definately much better viz at this time than Mermet – well worth the extra hour and a half drive. First of all, I have to say Wow!! We dove Pennyroyal on 6/29 and were quite impressed. The first thing that you will notice when you go to Pennyroyal is the staff! They were all super helpful, Chris even made us a hotel reservation the day before and saved us ten bucks! We did 3 dives, the first we followed the rock wall around the quarry. Vis was about 30+ feet at a depth of around 80ft. The 2nd dive we checked out the “attractions” in the “busy” area. Lots of cool stuff including a UFO to play. Vis was lowered a bit; there were several students in the water. Our 3rd dive we just piddled around, followed the wall for awhile, watched some fish, and took in a few more sites. This dive vis was much better than #2 we waited a little while before getting in and most everyone had already left; there were only 4 divers in the water including us! We do plan to return to Pennyroyal again as time permits; it was a six hour drive for us! Right now, unless you want to go deep, Pennyroyal’s surface viz isn’t much from all the rain we’ve had recently. I dove there last weekend (May 9th). I stayed shallow on my dives. The viz from the surface to about 10 ft was absolute 0. From 10 ft to the bottom of the shallows was about 10- 15 ft. I talked t some divers who went deeper & they said that below 40 ft it was nearly crystal clear. The second dive only lasted about 30 seconds, as I discovered that I had failed to completely zip my drysuit up. It quickly became a wetsuit; a very cold wetsuit. If the rains will stop, viz will probably return to the surface in a couple of weeks. I will be doing some check out dives on Sun. & will be there Sat. & Sun (camping) Memorial Day Weekend, if you’re at all interested. Since I’m off work 3/5 weekends I plan to be at Pennyroyal quite a bit this summer. My first thought upon rolling into Pennyroyal, was “where is everyone? ?” The day was forecast for rain but other than a little sprinkle, the weather was great. This was my 2nd consecutive week in the water, last week was at Blue Springs in Waldron , IN this week I hit the road down south to Pennyroyal. I counted maybe 6 or 7 other divers total during our day there. One giant stride off the little wooden floating dock and we made our way first to the 20′ platform to make sure everything was adjusted before we descended to the Blue Dolphin. Tom in his 5mm and me in my 7mm felt the thermocline give us a good “WHAT NOW!” at 30′. The temps went from the 60ish at the surface to the mid 40’s at around 35ish’. When we got to the bottom our bottom temp was 43 degrees. I was thankful for my full 7mm and I know Tom had to be chillin (literally) in the 5mm. Outside of a drysuit, nothing like a full bladder will do the trick to perk up the wetsuit temp….just rememebr to flush . 28 minutes later we surfaced. The second dive was going to try to be another deep dive, but already being chilled form the first dive, we altered our plan. Instead, we swam just at the thermocline along the wall and then over to the shallow end to gawk at the sunken stuff. The third dive was intended to look at the christmas tree forest on the other side of the quarry. We did a surface swim over to the other side and dropped down. I went a bit deeper than Tom on this dive, looking at only a few dead trees hanging off the side of the quarry walls. My deepest was 54′ and it was still 43 degrees at that spot. We again meandered around to the shallow end to look at the sunken things. Overall, yes the temps were a bit on the cool side, but the visibility wasn’t too bad, I’d say on average 15-20′. I am surprised I didn’t see more fish swimming around though. Update on Pennyroyal viz: I went down there last weekend, and all of the rain has taken a toll. Happily, I spoke with a buddy before I dropped the loot in the office. The viz in the shallows is <5ft. One of the guys swam into the bus, I'm told. The viz gets better in the deeper areas, but is still very cold. I may have to wait a few more weeks before I try it again. I was told that they plan to treat the water again soon, like they did last year…and that improved viz dramatically. We had a wonderful weekend of diving at Pennyroyal; the best vis I’ve seen anywhere this year outside of a cave! 10-15 ft. vis in the shallow water (until a rototiller swims through) and 20-30 ft. vis in the deep water–nice! Dove PR Sunday, July 3, 2011 and FINALLY found some clear water in the Midwest. 25-30 feet in most places (except around the helicopter in shallow where the newbies train), great along the walls. I would say it was even as high as 40 below that last cline (53 degrees above it, 42 below), the top cline is around 68 degrees. Surface is 80’s but it’s just the top foot or so that is that warm, still, not bad. On a in-water surface interval/dive planning session above the RV Motorcoach near the wall across from the shallow shelf, you could look down and see objects on the bottom 30+ feet below. As of July 3, I think it would be hard to find better water in the midwest than PR. I was there yesterday. I did 2 dives, the first deep and the second shallow. The vis was great from the top to the bottom 20’+ everywhere to start with. The first thermocline was at 19-20′. With the water being high in the quarry, the bottom around most of the attractions is about 23-25. It was 69 degrees at that depth. The first dive I was fairly well dressed for cold water but the second dive I didn’t wear a hood or gloves, My hands and ears were uncomfortably chilly if I was close to the bottom of the shallows. The vis deep was better than it was shallow but it seemed to be darker than normal. My light was on my harness but I hadn’t really planned on using it, when we hit 70′, I unclipped it and turned it on. The deepest we went was the deep training platform, 89′ according to my computer. The vis there was 30’+. It was 44deg there. The second dive was something that I was unprepared for. They were having a treasure hunt. I had never done one, so I thought WTF. All of the balls were in the shallows. When 60ish divers all hit the bottom at the same time the vis went from 20′ to about a foot! You almost need to be solo certified to do that because you chances of staying with your buddy are slim. I would say at least half of the divers, including me, lost their buddies. At one point, me and another diver swam into each other before we saw each other. On a plus note, I found a ball and won a nice dive watch. The place was very crowded. We stood in line for over an hour to get in. Good thing we brought our own canopy, as there was not a chance of getting a pavilion. We only dove on the shallow side. The vis was about 20 feet and kind of milky. I believe the vis was better down deeper and probably earlier in the week, before the crowd. Down to about 20 feet, the temp was in the high 80’s. We had a great time, and the staff was very helpful. Last Mon. it was 50 ft or better overall. I could see the top of the deep van at about 70 ft from 20 ft of depth. In the shallow section, I could easily see from attraction to attraction. I stayed shallow but temps ranged from 72 at the surface to 67 at 25 ft.
Update! Just saw a FB post from Kris Tapp (Owner). They say the Vis in the shallows has dropped to 5- 10 ft since the heavy rains. They say it is clearing, but very slowly. Oh my god, the Viz is Awesome right now! We had 40+ feet of viz and no particulates. I actually imagined I was in the Caribbean several times during these dives…clear blue water. Temps very comfortable down to 30′, below that get the thicker stuff on. PennyRoyal is back to open only on weekends unless you call in advance for weekdays. Spent some time talking to the owners and wait until you see what they are planning….just a glimpse for next year – heated showers and real toilets….Watch out Mermet. Spent Saturday of Labor Day Weekend with our friends at PennyRoyal. Being the holiday expected a huge crowd, but not so much. The weekend prior was standing room only. The weather was awesome a little on the hot side, but all the more reason to be in the water. Visibility was the best in the Midwest pushing 30 foot crystal clear. The temp was comfortable in the upper 70’s in the top layer. About 25′ it got pretty chilly. All in all another great trip and the best diving conditions in the Midwest. This weekend, it looks as if vis is beginning to improve. Towards the bottom of the shallow parts, it is still a bit murky, but there is a definite layering of clearer water at about the thermocline (17ft). Water is starting to warm nicely. 75 degrees from surface to17 ft, 65 degrees to 35 ft & cold below that. Mark your calendars to join our staff for a weekend of fun diving at Pennyroyal Quarry. 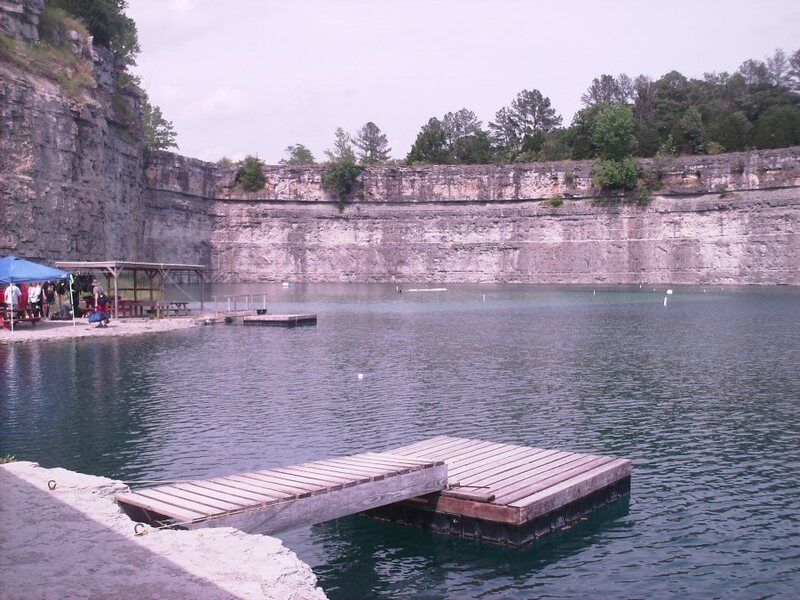 This 22 acre spring-fed quarry has depths ranging from 5-120 feet. Meet us at Pennyroyal at 9 a.m. for some great diving at a location many of our customers have not visited before. Make sure you bring you own lunch, snacks and drinks. Need rental gear? Call the shop to make your reservation – we will have a special for those headed to Pennyroyal. The quarry does offer air and nitrox fills on-site. RSVPs are greatly appreciated, 636-926-0880.